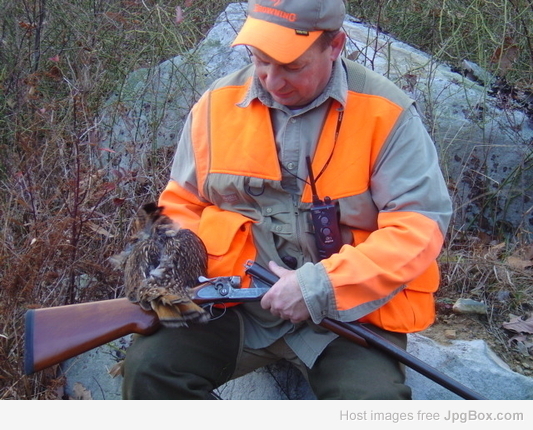 16ga.com ~ View topic - 16 Gauge Double Guns and Grouse Hunting. < 16ga. General Discussion ~ 16 Gauge Double Guns and Grouse Hunting. Because I grew up in a Fly Fishing/Grouse Hunting family being taught with my Grandfather's Parker 28 Gauge double gun, I still spend a lot of time in the latter part of Grouse season hunting with one. However my favorite Grouse Gun is not the 28, it's the 16, of which I own more than a few. Down thru the years from L.C. 's to J.P's, LeFever's and Brownings along with Win model 12's and even an old Boss I love them all. In fact Rich Painter this year just put one of our 1913 Field Grade L.C. Smith bird guns back on line for me, replacing the Barrels that had been severely damaged accidentally. Seating a different set of 1913 L.C. Smith Barrels on an old Elsie Breech is by no means childs play, all were individually hand made guns. Doing it correctly takes a true Master Gun Makers talent, Rich did a great job restoring the gun for me. Each of us has his own favorite Grouse and Woodcock gun. My Brother's happens to be his Browning 28 O/U, course he has been corrupted over to the dark side of Grouse gunning with the stack barrel Browning guns. 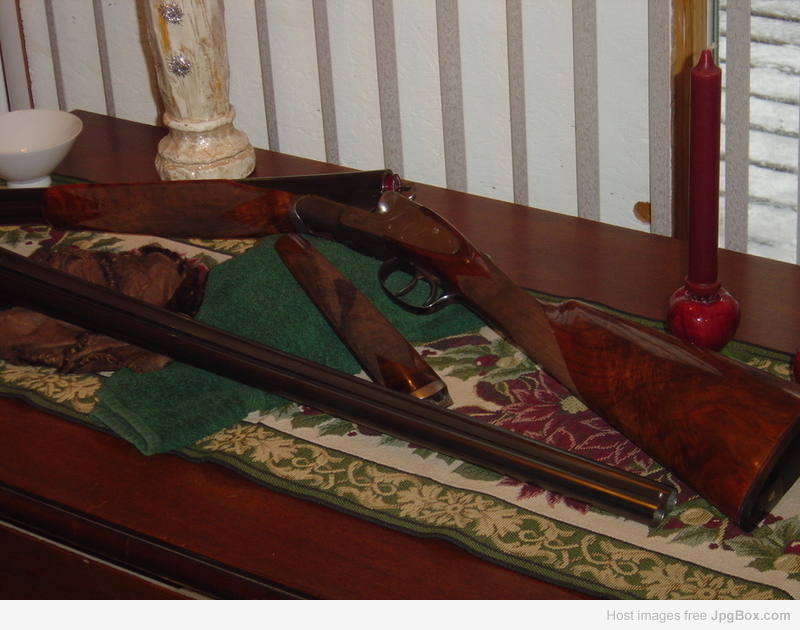 My favorite Grouse Gun is a Two Barrel Set L.C. Smith 00 with custom #1 Gun Spinning Clay Engraving by Kraus. A 6 1/2 Lb pre 1913 double gun with DT, and Special Ordered pre production French Walnut Stocks. The gun has 2 sets of Fore Stocks made individual for each set of Barrels. The gun was special order by my Grandfathers cousin Adam Fogie, after his death it was sold to my friend Walt Schiessl, the L.C. Man. Walt was nice enough to take this one of a kind pre 13 L.C. 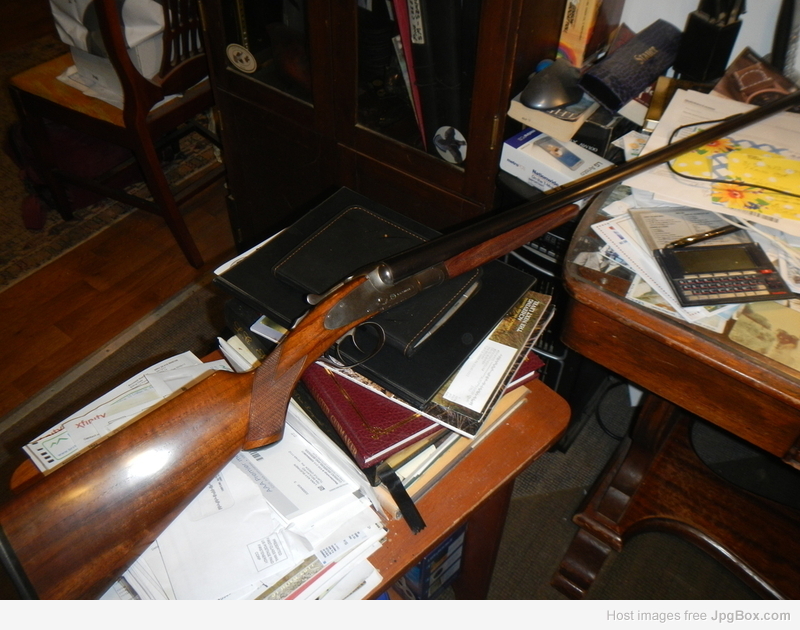 Smith double gun from his personal collection, and make sure I was able to put it back in our family gun safe where it belongs. I Grouse hunt with this incredible double gun each and every year. The 1913 Field Grade 16 Elsie restored by Rich Painter. 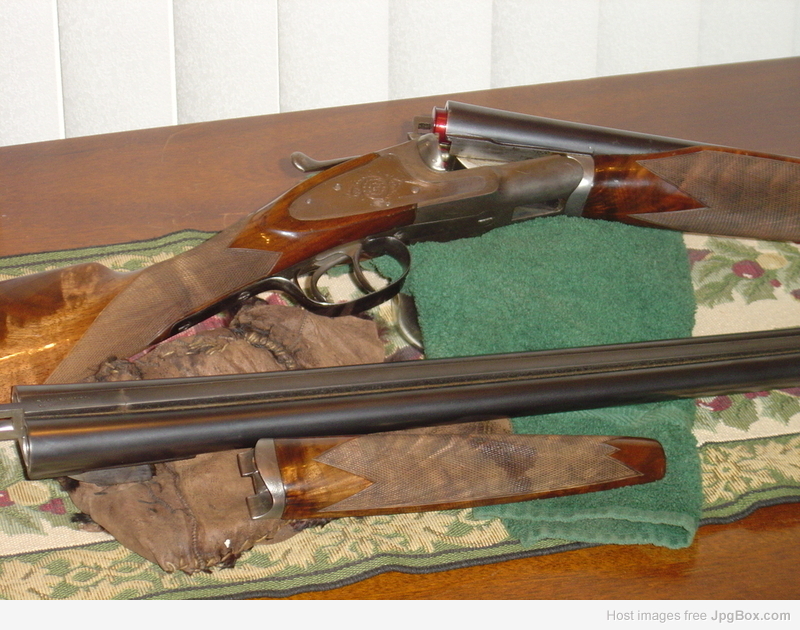 My Favorite Grouse Gun - The Pre 1913 Special Order 16, 00 Elsie, 2 Barrel Set. The light coloring on the stocks is from the lighting to help show the engraving, the true colors of the French Walnut stock are seen in the 1st picture of the gun without the intense lighting. The first sxs I ever hunted with was a 20 ga Elsie and I have had a fondness for then ever since. I own a few including a 16 ga field grade hunter arms gun and a exposed hammer 16 ga that was partially restored by Mr Turnbull. I know that there are a lot of critics of the Elsie, and I am sure they have some valid points, but I think they often are blinded to her good points. I will just keep on enjoying them and let the wind blow where it may. I recently added a 1929 16 gauge Field Grade Feather Weight to my safe. I bought it from a friend and haven't had time to shoot it yet, but it sure feels good! My very first American classic after a couple decades of chasing SxS's. Lots of Grouse hunters carry 20 Gauge L.C. Smith Shotgun in the Grouse woods, and will never give them up. I own a few pre 13 20's and they are fantastic, especially the DT guns. However for all around Grouse gunning my go to gun is the 16, carries like a 20, hits like a 12. The SpredR shells make the 16's even more deadly. The new 2 1/2"shells are just fantastic in the old Elsie guns. Never worry about what other people say, always form your own opinions/judgements by your own actual experience, especially with humans, guns and dog. Never be led by other peoples opinions, they usually have their own agenda's. My 1913, 16 Gauge Elsie Hammer Gun, gifted to another younger Grouse hunter for Christmas. Still looking to acquire another one similar to it, even today. A truly serious Grouse gun. That hammer gun is wonderful! Definitely a mistake gifting it for sure. Great looking guns Dave; I'd be proud to tote any one of 'em in anybody's woods! Thanks buddy appreciate the nice comment. Man you are going to love the 1929 FW 16 L.C. Smith especially for Grouse and Woodcock hunting, Congrats on a fine pick up. Having just had Rich Painter install the 30" Krupp Barrels on my old 1913 Field Grade gun, I intend to use her on Pheasant and Ducks this coming season. Dave the new 2 1/2 SpredR shells should work great out of your 1929 FW 16, give them a try! If the gun has 2 3/4 Chambers definitely give the 2 3/4 SpredR's a try, I love the patterns they throw! Rich Painter's fine work on the old L.C. Smith Field Grade once again.